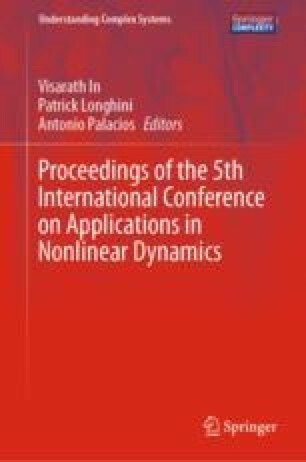 This research offers an additional approach to the increased interest in information theoretic techniques utilized in the Theory of Communications, Electrical Engineering and Signal Processing disciplines for extracting nonlinear behavior in dynamical systems. This new approach was, in part, motivated by a diligent effort to create a man-made system that mimics the sound generation of a cicada. This insect has tremendous sound production capacity for its size. For the Okanagana and Magicicada species studied in this research, these cicadae ranged in size from five to six centimeters and produce sounds that are heard several hundred meters away. The evolution of this new signal processing algorithm from this bio-inspired research is explained in this article. This investigation initially examined the cicada hypothesized nonlinear system, by employing a number of numerical techniques in which to identify nonlinearity in a measurement times series. One such technique, the Nuttall modified-Volterra approach would serve as the validation and verification process for confirming that the inherent artificiality introduced by converting the sound production system of the biologic system to a man-made device did not corrupt the inherent dynamics of the cicada mating call. The technical advantage gained from quantification of the expansion kernels using the Nuttall approach, is the creation of more characterization clues by extending beyond the linear kernel response. This unique method is based on an extension of earlier developments of Vito Volterra and Norbert Wiener. The new Nuttall-Wiener-Volterra (NWV) method identifies the existence of nonlinearity in a measurement time series and determines the power distribution of individual nonlinear components. Moreover, the NWV method, unlike other methods that are likely less computationally efficient due to the Curse of Dimensionality (COD), significantly reduces the computational workload, thereby making characterizations of nonlinear systems with memory at higher orders possible. The nonlinear system kernel responses reveal identification and characterization of linear and nonlinear dynamics contained within the system under investigation. Thus, the nonlinear kernel responses computed for the cicada exposed a critical development for the NWV technique, namely that in order to obtain meaningful NWV kernel responses (i.e., to have physically and mathematically sound computational results), there are restrictive requirements for the system input excitation to be (a) band-limited, (b) white Gaussian and (c) zero mean. By studying the anatomical structures in the cicada sound production system and developing the wave propagation and finite element (FE) models this effort also then attempted an approach to confirm the accuracy of these models by employing the NWV nonlinear (and linear) analysis method.